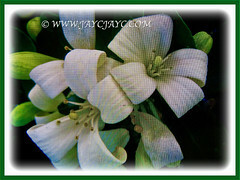 A plant that flowers throughout the year, producing amazingly fragrant flower clusters. It will be a most welcomed addition to any tropical garden if you desire to add scent to your garden. The fragrance is absolutely divine, to say the least! 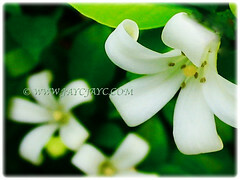 Botanical Name: Murraya paniculata (syn. : Murraya exotica, Chalcas paniculata, Chalcas sumatrana). 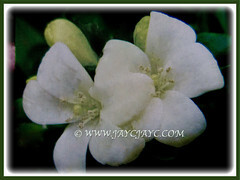 Common Names: Orange Jessamine/Jasmine, Chinese Box, Mock Orange/Lime, Lakeview Jasmine. Etymology: The genus name, Murraya honours Dr. Jahann Murray, an 18th-century Swedish botanist. The specific epithet, paniculata refers to the flower inflorescence. Origin: Native to southern China, Taiwan, the Indian sub-continent (i.e. Bangladesh, India, Nepal, north-eastern Pakistan and Sri Lanka), south-eastern Asia (i.e. Cambodia, Loos, Myanmar, Thailand, Vietnam, Indonesia, Malaysia), the Philippines and northern Australia. It is also cultivated worldwide. Plant type: An ornamental, tropical and evergreen tree or shrub. Features: Murraya paniculata is a species of the genus Murraya that consists of about 8 accepted species of flowering plants. 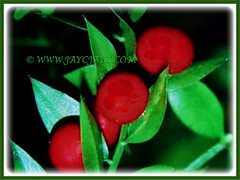 A medium-sized, tropical and evergreen tree or shrub, growing between 2-5-3-5 m in height. It has a dense and twiggy habit. A multi-stemmed shrub that produces evergreen and dark green leaves that are glabrous and glossy, occurring in 3-7 oddly pinnate leaflets which are elliptic to cuneate-obovate. 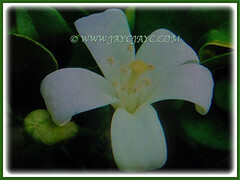 It produces flowers that are terminal, corymbose and strongly fragrant. 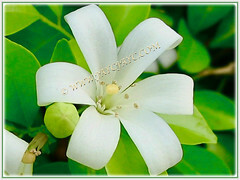 Petals are 12–18 mm long, recurved and white or fading cream. 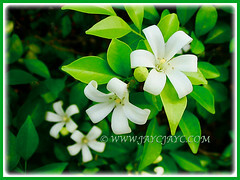 The common names of Orange Jessamine and Mock Orange are applied as the flowers have the scent of orange blossoms. The plant flowers throughout the year. The flowers will eventually be followed by small, fleshy and ornamental red fruits, each up to 2 cm long and containing 1-2 seeds. 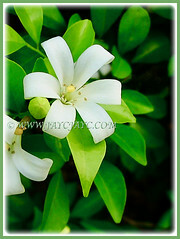 Culture (Care): Murraya paniculata or Orange Jessamine can be easily grown with minimum care. Moisture: Moderate water requirements. Allow soil to dry between waterings. Do not keep it waterlogged, otherwise root rot may occur. Soil: Best in humus-enriched, well drained, sandy and loamy soils. Others: Prune regularly to maintain a tidy hedge. It is highly ranked on Australia’s invasive weed list. Be aware that it is highly allergenic to many when in flower. Sufferers may experience headache, blocked sinuses and breathing difficulties. Generally free from serious disease or insect. However, do watch out for borers, soil nematodes, scales, sooty mold and whiteflies. For subtropical and temperate regions: Hardiness: USDA Zone 9b to 12. A small, tropical to sub-tropical tree or shrub, Murraya paniculata can tolerate an occasional light frost. Best to site the plant at a location sheltered from strong winds. Flowers are produced in abundance in spring to early autumn. It tends to flower after a heavy rain. Where winter hardy, this beautiful shrub is often grown as a hedge or screen. For non-hardy regions, plants may be grown in containers and overwintered indoors. Propagation: By softwood cuttings. Can be propagated from seeds by birds and even self-propagated. 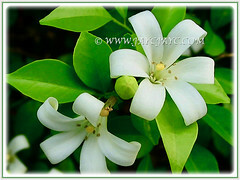 Usage: Murraya paniculata or Orange Jessamine will be an excellent landscape shrub with its abundance of sweetly scented flowers. It is ideal as an ornamental privacy screen or hedge. Suitable to be grown at parks and gardens. It can be grown on the ground or planted in large containers/tubs. The fragrant flower clusters are a magnet to bees while the fruits to small frugivorous birds. In certain regions it us used in traditional medicine as it has anti-diarrhoeal, anti-nociceptive and anti-inflammatory activities.